MADE IN DUTCH SURINAM AND PART OF SENIORS ESTATE. 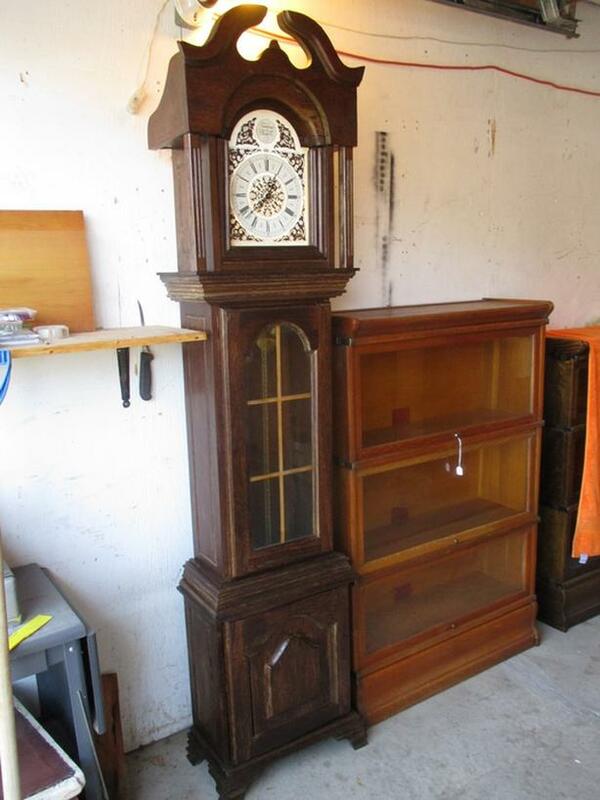 THIS GRANDFATHER CLOCK IS 19 INCHES WIDE, 10 INCHES DEEP AND 80 INCHES HIGH. IT HAS A CARVED CROWN AND AN OPEN FACE. IT HAS A GERMAN MADE MOVEMENT. THE WEIGHTS ARE TYPICAL DUTCH PEAR SHAPED. IT HAS A CENTER GLASS DOOR SHOWING THE WEIGHTS AND PENDULUM. BELOW IS A DOOR COVERING STORAGE SPACE. IT STANDS ON FOUR CARVED FEET. IT CHIMES GENTLY ON THE HALF HOUR AND FULL HOUR. A LEVER ALLOWS FOR TURNING OFF THE CHIME. IT WORKS WELL AND KEEPS GOOD TIME.